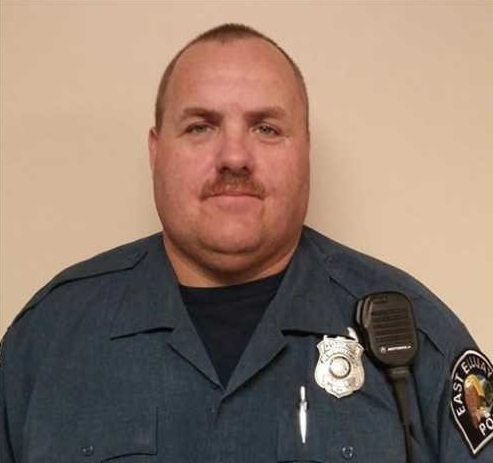 Today, Monday, September 17, the East Ellijay Police Department cleared Officer Thomas Dwayne Long of any wrongdoing over Long’s online support for the Ku Klux Klan. 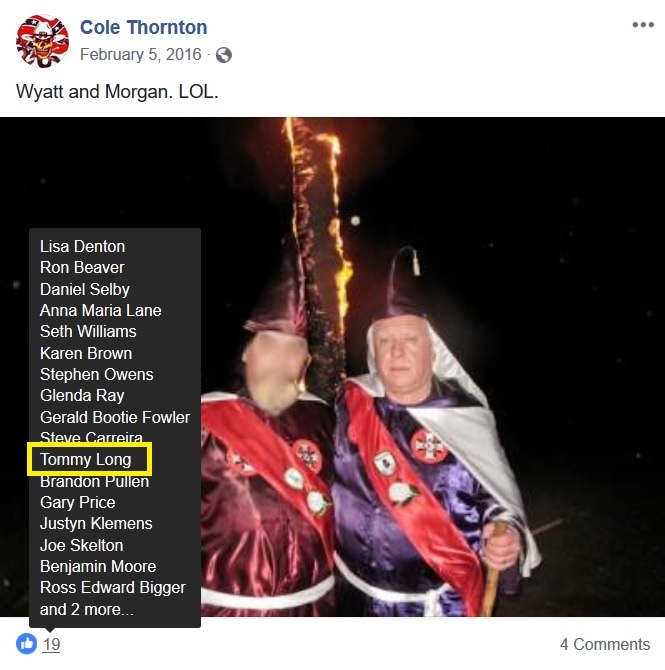 During 2016 and 2017, Tommy Long “liked” explicit Klan materials posted to Facebook profiles for two United Northern and Southern Knights of the KKK leaders, Imperial Wizard Charles Geoffrey Denton and Georgia Grand Dragon Justin Stephen Owens. Tommy Long has been on paid administrative leave since Thursday, September 6, the day after Atlanta Antifascists exposed Long’s pro-KKK Facebook activity. Early the next week, EEPD Chief Larry Callahan was already signaling that he would clear Long. This Monday, Callahan made that decision official. Atlanta Antifascists consider the EEPD investigation into Long a sham. In a recent interview with The Atlanta Journal-Constitution announcing the imminent end of his investigation, Chief Callahan stated: “We’ve even interviewed a man identified to be a leader within the Klan, and that didn’t show anything.” Words from a Klan leader were treated as outweighing extensive documentation. 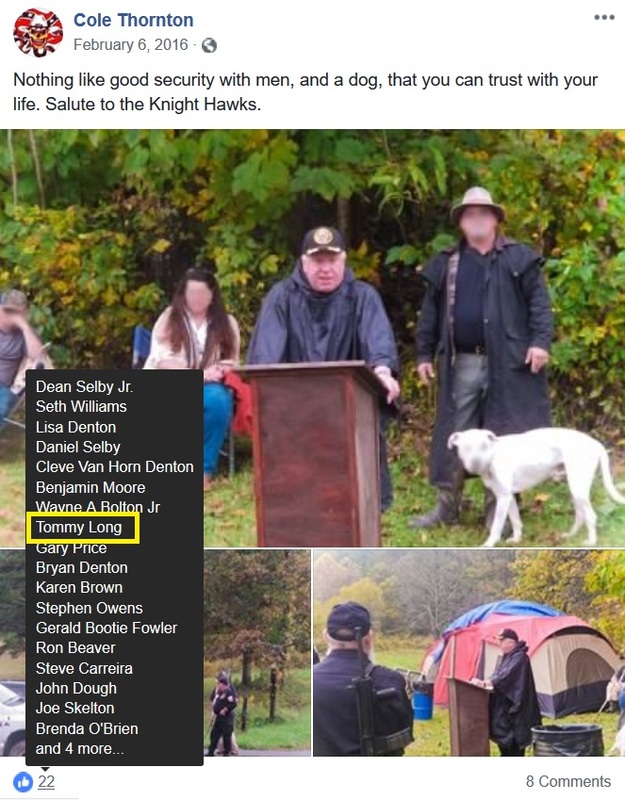 Chief Callahan had already stated that Tommy Long knew UNSK Imperial Wizard Charles Denton from a “flood rescue” years ago, as though this made Long’s subsequent association with the Klan leader innocuous. 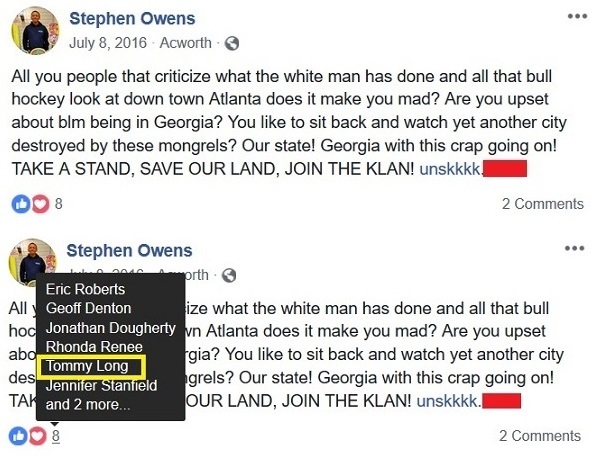 White supremacist Justin Stephen Owens has issued his own incoherent defense of Tommy Long and their Facebook relationship, which Atlanta Antifascists circulated on Twitter Saturday. 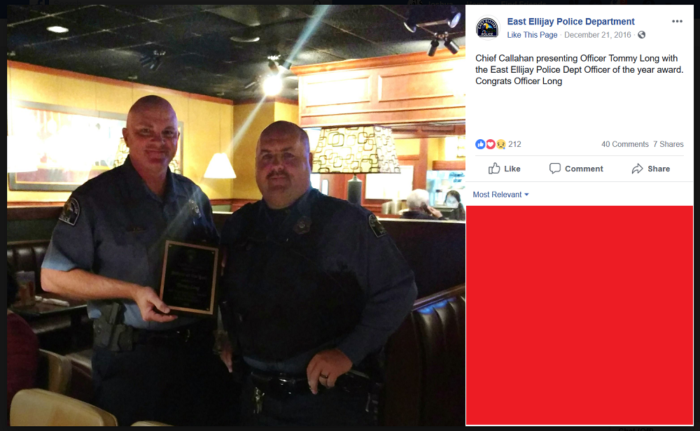 At the heart of the East Ellijay Police Department’s defense of Officer Long is the claim that Long did not actually “like” Ku Klux Klan materials, such as a KKK recruitment message stating “JOIN THE KLAN”; pictures from a Klan rally; a UNSK “blood drop” ring; a message about the Klan backing up the police; and an image referring to lynching. EEPD says that Long was hacked and he “lost control” of his Facebook account. Larry Callahan also claims that Tommy Long’s Facebook account was configured to automatically accept friend requests, despite this not being a standard Facebook feature. Police Chief Callahan is by his own admission ignorant about how social media works. Callahan cites two pieces of evidence for Tommy Long being hacked. 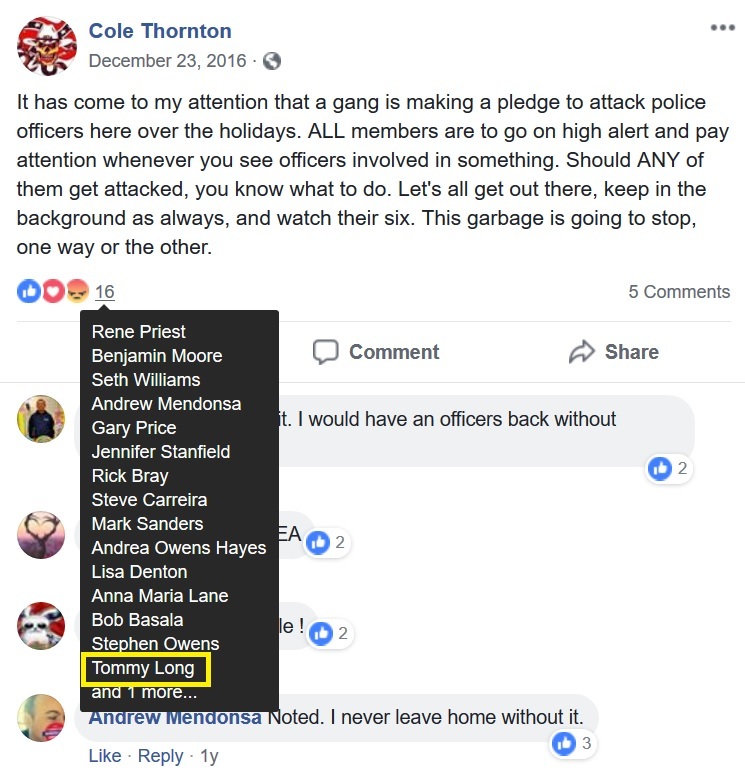 First, Callahan states that Tommy Long’s Facebook account reactivates after being deactivated – something which could be due to apps rather than hacker activity. 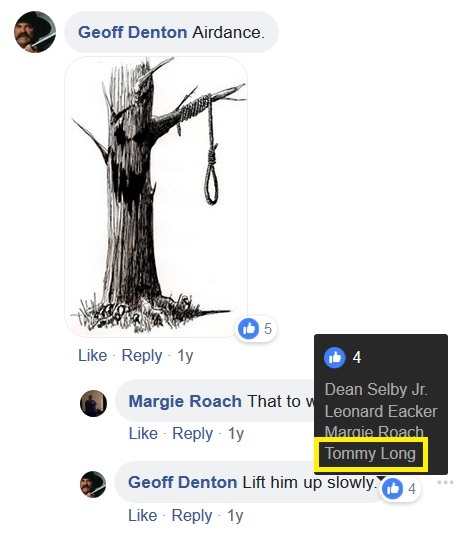 Second, Callahan states that Tommy Long could not “unlike” some of the Klan posts which his account had earlier “liked.” Callahan cites this as proof that Tommy Long never endorsed the Klan materials to begin with. However, Tommy Long removed six Facebook profiles for two Klan leaders from his Facebook friends list soon after he was exposed. Removing the Facebook friends makes it more difficult to remove “likes” on these profiles. Every piece of evidence for alleged Facebook hacking has a more likely, non-hacker explanation. Prior to being exposed for his pro-KKK Facebook activity, Long was contentedly posting away on Facebook with no indication of having “lost control” of the account. 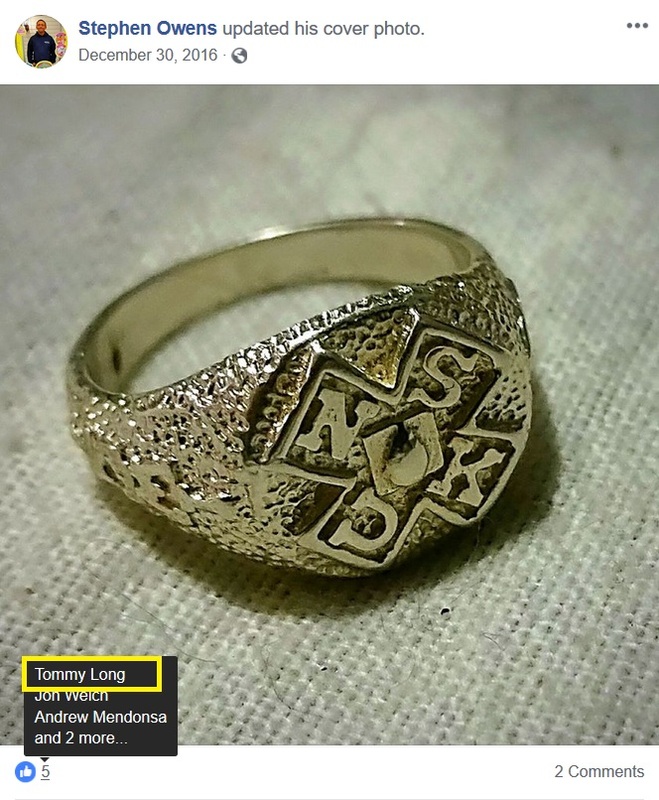 The hacker story is convenient for Tommy Long and the East Ellijay Police Department, but there is no reason to believe it’s true. Atlanta Antifascists have already pointed to other holes in the “hacker” fiction. EEPD sticking to this story is as embarrassing for them as it is insulting to everyone else. East Ellijay Police Department is demonstrating that it will not treat the issue of a Klan supporter in its ranks seriously, since any old excuse will suffice. It is no surprise that the police serve their own power more than they do truth, fairness, or the very communities they supposedly “protect.” Still, the EEPD’s stance is so brazen we hope it receives a strong public response.